Mary Poppins. You know her. You love her. And if you’re a mom, you wish you had your own Mary Poppins, if just a little bit of that magic. If only it were as easy as saying “spoon full of sugar helps the medicine go down.” We’ve all been there, had moments as parents where we question whether or not we are making the right choices by our kids. Whether or not we are enough. And we often look to ourselves when our children make mistakes or have behavioral or health concerns. Is it or was it our fault, somehow? The doubts can pile on heavy, if you let them and the mom guilt becomes stronger and stronger. To top things off, we tend to emulate what we saw growing up. If our parents were a certain way with us, it is highly likely that we will give off a similar vibe as adults. It’s genetics and until recently, I had the most difficult time fighting against it. I was set in my way as a mom. And I often used my experiences growing up as a crutch for putting some unrealistic expectations for my kids, despite their learning differences. I often complained, lamenting the challenges that I faced as a special-needs mom. I struggled to find a happy medium between keeping hold of my roots and find some new and unique approaches to motherhood- tactics that would be better conducive for children with learning differences. And then another challenge was furthering that differentiation among three very different children with different needs. No one said this job would be easy! So where does Mary Poppins fit into all this? After all, she was a no nonsense nanny with some special abilities who seemingly doesn’t age at all (see Mary Poppins Returns). She refuses to listen to the children’s complaints and expects things to be done just so. At the surface, she is essentially how most adults in my life have been. Growing up, there was the expectation that adults were to be respected; that if your parents or a trusted adult, like a teacher, told you to do something, you did it. There was no talking back, no throwing tantrums, and absolutely no refusal. That could result in a punishment or worse, a spanking. It’s old school parenting. But in many ways, even as a nanny, Mary Poppins practiced a progressive kind of parental guidance; one that embraced and celebrated the differences in all of us. We simply need to change our perspective. Perspective is everything. It dictates our reactions or responses to events and situations. It can be instrumental in setting our views about different ideas and thus our belief sets which obviously influence a slew of other facets about our personality, including our behavior. It is easiest to see things as they are, black or white because then there’s no questioning it at all. What you see is what you get. And I thought parenting would be just that; after all, it was with me. I didn’t like the feeling of disappointing my parents and I took pride in being well-liked among my teachers and my friends’ parents. I hated confrontation, and so it was easier for me to just do as I was told. My parents must’ve had an easier time implementing their experiences in their parenting style, as I’d often hear “when I was growing up” as the explanation for what expectations were what they were. The perspective was clear; I was the child and they were the adults. However, in my world, perspective is a fluid concept. All children are different and learn different. They respond to situations in their own unique way and so a one size fits all parenting style won’t cut it anymore. Today’s parents need to constantly change their perspective to better understand what works and what doesn’t work for their child. One of the most iconic Mary Poppins scenes that I remember is the one where she is instructing the children to clean their room and of course as most children do, they are reluctant. I’m sure we’ve all heard this before from our own little ones. It’s too hard! I can’t do it! It’s boring! Mary already knew these children would try this and so she simply said, ” a spoon full of sugar helps the medicine go down,” meaning that when you can change your perspective of what it means to clean your room, it can get done without all the fuss. Another more recent scene I remember from the Mary Poppins Returns movie was the shop scene with Meryl Streep as “Cousin Topsy” who owns what a fix-it shop. Curious thing about this shop… every second Wednesday, it would flip upside down, causing her so much stress that she refuses to do anything. Nothing can be done when everything’s mess, right? Wrong! 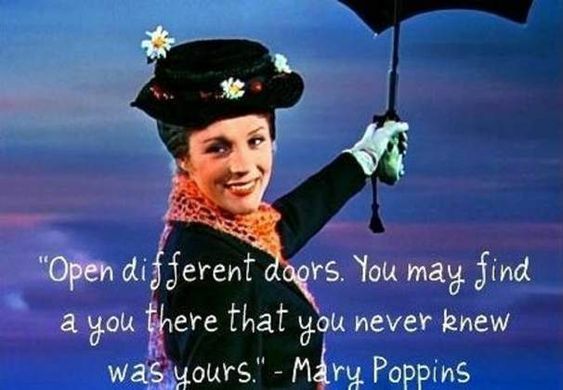 Mary Poppins simply encourages Topsy to change her perspective, that even though things might seem different and unconventional, it is still possible to be creative and productive. And by the end of the song, Topsy’s confidence is magically restored in a way that only Mary Poppins can induce. Come to think of it, most of the second movie leans on a change in perspective theme, encouraging its characters to be creative within seemingly impossible and challenging moments. That in fact, nothing ever is impossible and even the most challenging of situations has a solution, or three or four or 15 hiding behind the thick, twisty vines of attitude, motivation, and creativity. Mary Poppins exhibits these four ideas extremely well, telling us that “the cover is not the book.” Just because something may look difficult, or our children might learn differently, those behavioral or educational challenges do not define them. It is our responsibility as parents, caregivers, and teachers to figure out how to help them write their own unique story, one that implements their differences as strengths over weaknesses. We must teach them how to become their own advocates so that they too know that their cover (diagnosis), is not their book (lives). All it takes a little change in perspective.